Microsoft Azure: Building The Enterprise IoT Cloud! Inspiration for the project came one winter night when my daughter's room was too cold but I could not allow the heater to stay ON while she slept. When I started designing the project, I thought, If I put a WiFi enabled controller like MKR1000 in there then I can do lot of cool stuff apart from safety. That's where smartphone connectivity, auto-ignition using motorcycle parts came into picture. There is some good learning along the way like solenoid current control, level conversion by a NAND chip and unbricking a MKR1000! Heater is sending telemetry data to Azure through IoT Hub. The Stream Analytics job is doing near real time analytics on the device data and will post alerts based on the SQL request it is configured with. The Worker role will pick up the alerts generated by Stream Analytics and will forward the alerts to the device through IoT Hub. Only attempt this project if you have sufficient experience in working with gas and electronics. To avoid fire hazard, be sensible when attaching cardboard and electronics to gas appliance. 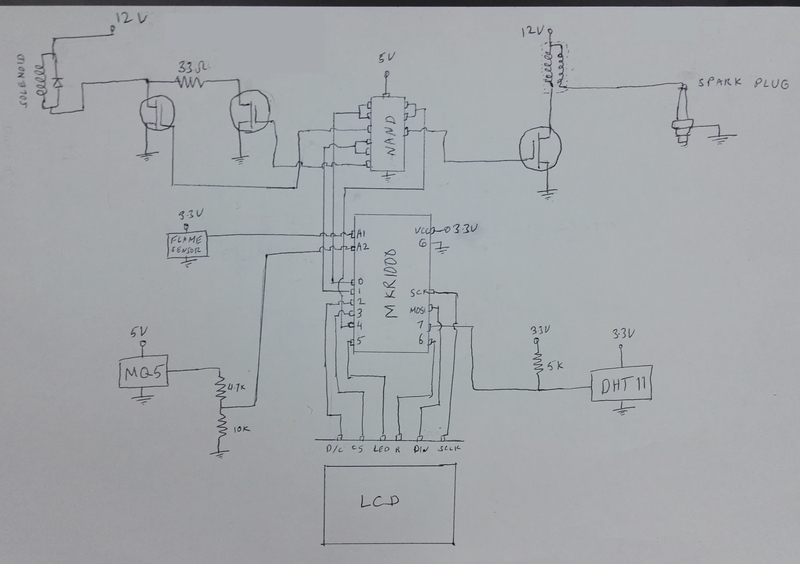 Please see the video at the start where I explain the hardware choices, also check out attached schematic. At the time of building this project MKR1000 was not released and documentation was not public. My concern was the MQ5 gas sensor uses heater and the current demand may not be met if connected to MKR1000 power rail. To be safe I configured the buck converter to provide the 5V rail. Then used MKR1000 on board regulator to provide 3.3V rail. If you got 3V compliant MOSFETs like FQP30N06L from Sparkfun, then you don't need the Quad NAND chip, but you do need to pull your MOSFETs down by a 10k resistor. I just used an old shoebox and cut it to my spec. Laser cut Acrylic sheet was my first choice but did not get my hands on it. After fitting I realized that my solenoid was leaking gas. I open it up and discovered hole in its disk. A little super glue fixed it. I needed a mount for flame sensor so that I can adjust it for best view of flame without getting lot of heat. 3D printing solved that issue. In addition the flame sensor needs to be protected from ambient sunlight. I 3D printed a cover for that purpose. LCD mount was needed to raise it close to cover for easier readout. LCD is running screensaver. The code is part of my Sketch just not enabled in the final version. Create another pair of Stream Analytics job and Event hub for bridging controllers and devices. Create a Storage account that will be used by the worker roles. Deploy worker roles that will read alerts from the Event hubs and forward alerts to devices through the IoT hub and send Tweets. In the jumpbar, click New, then click Internet of Things, and then click IoT Hub. In the New IoT Hub blade, specify the desired configuration for the IoT Hub. In the Name box, enter a name to identify your IoT hub. When the Name is validated, a green check mark appears in the Name box. Change the Pricing and scale tier as desired. This application required a paid tier that allows multiple devices. In the Resource group box, create a new resource group, or select and existing one. For more information, see Using resource groups to manage your Azure resources. Use Location to specify the geographic location in which to host your IoT hub. Once the new IoT hub options are configured, click Create. It can take a few minutes for the IoT hub to be created. To check the status, you can monitor the progress on the Startboard. Or, you can monitor your progress from the Notifications section. After the IoT hub has been created successfully, open the blade of the new IoT hub, take note of the Hostname, and select the Key icon on the top. Your IoT hub is now created, and you have the Hostname and connection string you need to update in software. Log on to the Azure Management Portal. In the lower left corner of the page, click on the + NEW button. Write down the connection string for the readwrite policy name. In the jumpbar, click New, then click Internet of Things, and then click Stream Analytics Jobs. Enter a name for the job, choose your subscription, select the same resource group you created when creating the IoT Hub, Select the location, and click on Create. Shared Access Policy Name = "iothubowner"
Event serialization format = "JSON"
Back to the Stream Analytics Job blade, click on the Query tile. Event Hub Name = "myeventhubname"
Event Hub Policy Name = "readwrite"
Partition Key Column = "4"
But end up not using it. Please note that flame sensor value go down when it sees flame, while a gas sensor values go up when it smells gas. Enter the name of your choice (i.e. "mystorageaccountname" for the account name and select your resource group, subscription,... then click on "Create"
You need to install the following features in order to build and run the application and Azure web role projects. The latest edition of Arduino SAMD board definitions did not work with MRK1000. I had to install older release 1.6.3 in order to get it working. https://github.com/arduino-libraries/WiFi101-FirmwareUpdater to get your device to talk to Azure HTTPS. You need to use hostname of your IoT hub. // Set software SPI specific pin outputs. // Set software SPI ports and masks. // Set common pin outputs. Two days before submission I was hit by an unpleasant surprize that my MKR1000 stopped appearing as USB serial port and I was no longer able to program it. It was truly an anticlimax. There is no documentation on MKR1000 that could help me figure out the issue. I noticed the JTAG debug port. I looked around and found Adafruit excellent write-up for Arduino Zero. It did not work out of the box but still I just need to workaround some compiler issue. I was able to restore the bootloader and my board returned to normal. One weekend I needed to travel out of town and I wanted to work on this project. In absence of hardware I wrote a Universal Windows Application to simulate heater behaviour with Azure cloud. It was such useful testing tool that even after returning back, I kept using it to try different scenarios and parts of the cloud setup which are either difficult, or too slow to do with actual hardware. The code for simulator is present in GitHub. To get an idea of the difficulty, see below video where I test out Humidity sensor on actual hardware. Below is the video when I tried the gas sensor first after installation. When editing queries on Stream Analytic job, I found it useful to use "test" feature in old Azure management portal. Here you can upload json data and see the results of your query instantly. Universal Windows App talks to MKR1000 on heater via Azure to turn the Heater On and set temperature. In below video, I take the gas pipe off in order to trigger the gas sensor. Please notice the sensor values goes up on serial console and my Azure Stream Analytics job, sends a Tweet, a user notification as well as turns the heater Off. In next video, I turned the gas off in order to cause an ignition failure. See how application gets notified of the issue. I like to thank Microsoft for extending me free trial of Azure so that I can play around with this commercial grade technology as a hobby project. Flame sensor needs an adjustable rail for proper operation without heat up. Flame sensor needs cover to protect from ambient sunlight. Please bear with me the hand drawn diagram. fritzing.org was down on the day of submission. Thanks to Ladyada and Olivier Bloch.